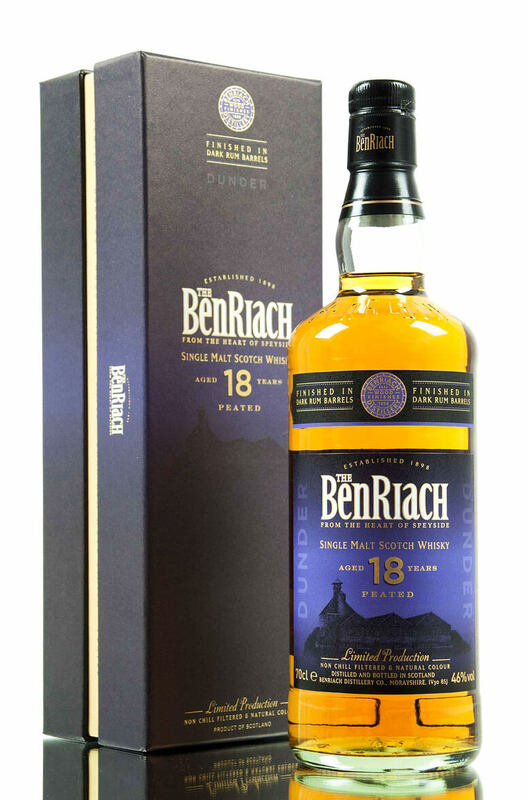 This is a limited edition peated (smoky) expression of Benriach that has been finished in the finest Jamaican rum casks. The name dunder is taken from the residue left over from the rum making process. It is a yeast rich liquid which is used again from batch to batch and is said to give Jamaican rum its unique flavour. This whiskey pairs those fruity, vibrant rum characters with some pungent peat smoke and gently spicy oak. Aromas (without water) Crisp candied peel holds waves of soft peach and ripe banana dusted with Demerara sugar. Delicate rounded peat smoke combines with gentle sweet oak spices. Flavour Dramatic peat smoke and barley complement crisp citrus zest, white pepper and fresh ginger. Caramelised orchard fruits and dried apricots develop to a rich grassy wood smoke finish. Number Of Bottles Released Just 1888 bottles. Types of Barrel used for Aging Initially matured in American oak, followed by a finishing is dark Jamaican rum barrels.